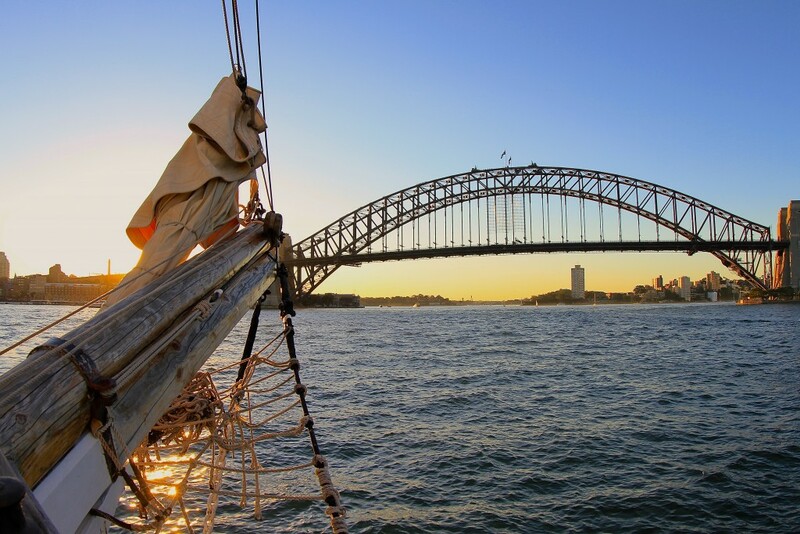 Sailing Sydney Harbour by Tall Ship, Australia. This year my sisters and I decided that rather than clothes or perfume or toys or something sensibly useful, we’d give each other Fun for Christmas. We decided to have a short Indulgent Adventure together. Getting ready to set sail at Circular Quay, opposite the Opera House, Sydney, Australia. Ideas for a short indulgent adventure were varied from High Tea with a view of the Sydney Opera House at the Park Hyatt, to mustering cattle in the Megalong Valley in the Blue Mountains. We needed four siblings to agree on the choice. Negotiation, of course, is a subtle skill, and it’s important not to offend anyone or disparage anyone’s idea of fun. “I’d rather poke a fork in my eye,” T. opened negotiations with, referring to High Tea. Mustering won a lot of enthusiasm from the participants, but less from the partners (safely excluded from High Tea but not so safe from mustering and possibly thinking about forks themselves). 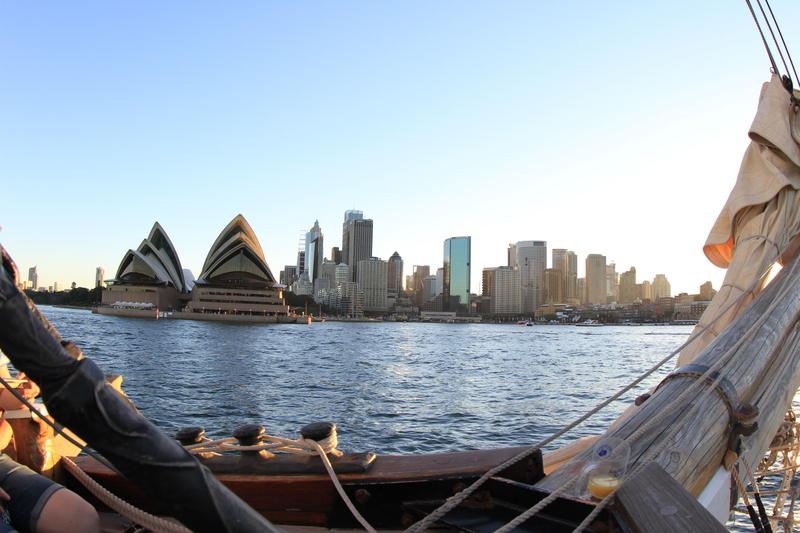 In the end, it was agreed – Dinner on the Tall Ships cruise on Sydney Harbour! The weather was perfect on the day (note: the Tall Ships sail rain, hail or shine, so be prepared for less than perfect). The ship has all the character that you would expect, but only a nominal number of sails – they look pretty but truth be told the diesel motor does all the work. 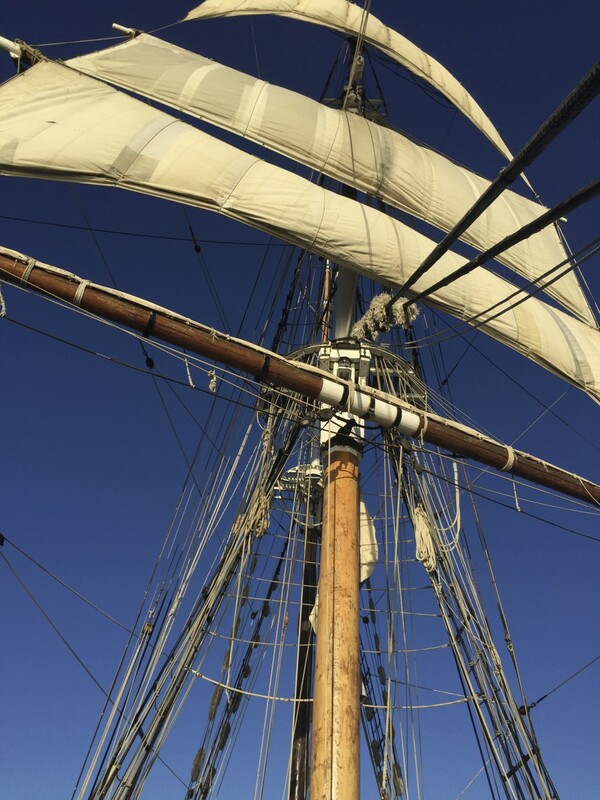 The magnificent sails unfurled against Sydney’s blue sky. Up to the Crows Nest to look for Pirates! The Tall Ship sets sail from Circular Quay, Sydney. On arrival you are met by the crew and given an orientation of the ship and the course of the evening. The Dinner cruise is about 3 hours. A beverage package was offered on arrival and you also had the option to sign up for a mast climb at an extra cost. I couldn’t wait to try it! It didn’t look that far from the deck…. 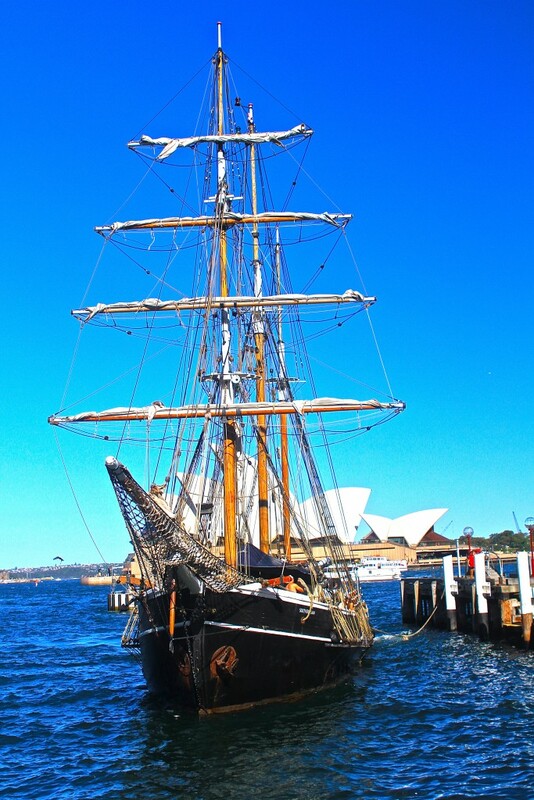 Plenty of Pirates in Sydney to spot climbing the Mast on the Tall Ship, Sydney Harbour. The mast looks MUCH higher from the rat lines than it does at the jetty, but you are roped onto a safety line. The climb is quite easy except that getting on to the crow’s nest at the top is a bit tricky. You can always turn around and go down again at any point, but if you do and there’s a person following, they have to go down too. If you do plan to do the mast climb, I advise loose clothing, no dress (one girl did climb in a dress! ), well-attached footwear, and take a small camera with a lanyard that you can attach securely to your person. I highly recommend it (at least in perfect weather like we had). Alcohol is prohibited before the climb for obvious reasons, but a beer afterwards tastes rather fine. Dinner is a buffet, with a kind of stew (either chicken, beef or pork), a bread roll, some green salad, chick peas, and potato salad. 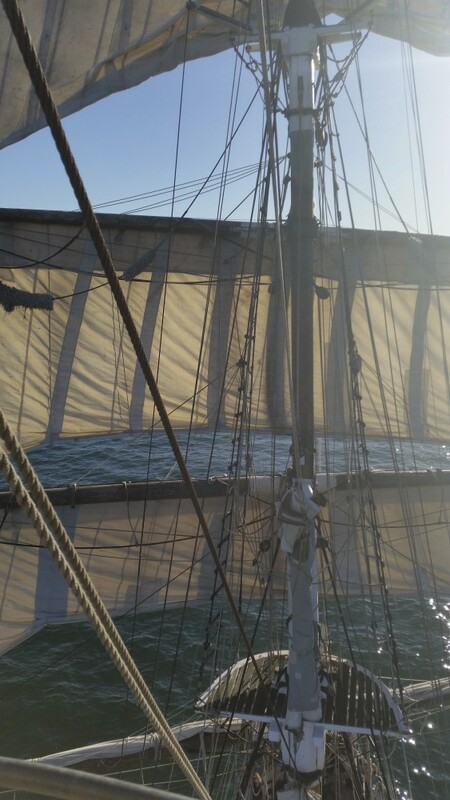 Not exactly a gourmet feast, but we ate perched at the front of the ship in the sun, watching the water with the sails above us flapping idly in the breeze – very very pleasant indeed. Sydney at sunset, no better place to see it than the harbour. All too soon the sun is setting behind the Opera House (literally) and we’re sailing past Fort Denison and back into Campbell’s Cove to watch the last of the sun’s rays pink the sails of the Opera House – what a perfect Christmas present! I had forgotten just how beautiful Sydney harbour is. PPS. If you are visiting Sydney – a sunset Harbour cruise is a great way to enjoy seeing Sydney’s major sights – the city, Opera House, Harbour Bridge, Luna Park, the Heads…etc. 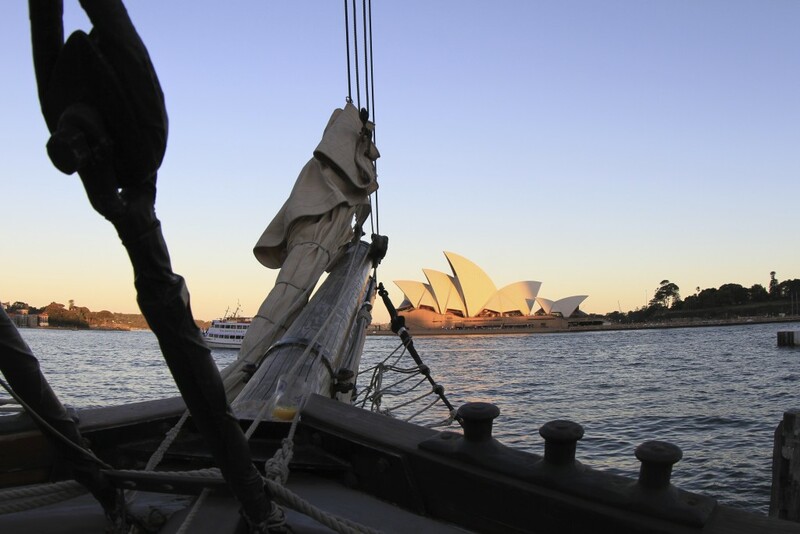 The Opera House at Sunset from our Tall Ship Sydney Harbour.